No other method of water filtration or purification - including Reverse Osmosis, Gravity Filters, Plumbed-In Cartridge Systems or Jug Filters - will completely remove Micro-Plastics and Micro-Beads from UK tap water. Plus, these systems require a regular supply of disposable plastic coated filter cartridges which can cost up to £100.00 or more each year to replace. Included with each EauWelle® Water Purification System is a 12 months supply of eco-friendly granulated carbon sachets that are designed to absorb any volatile gases that may be present during the purification process. Unfortunately it is too late to rid our land, rivers and oceans of indestructible micro-plastics and other non-biodegradable garbage. For decades successive Governments around the world have 'turned a blind eye' - incredibly allowing manufacturing companies to contaminate toothpastes, body scrubs, shampoos, conditioners, laundry & dishwasher detergents with plastic micro-beads. This 'criminal' practice has been poisoning Planet Earth for far too long - yet only recently have manufacturers been instructed to desist from adding these almost invisible but extremely harmful pieces of plastic to personal care products. Be aware; if you eat freshwater or Ocean caught sea food - especially shellfish - it is very likely you are consuming this poisonous petrochemical waste material on a regular basis! Does that concern you? Well at least you can drink absolutely clean, pure, plastic-free water from now on if you take our advice! The EauWelle® water purification system from Primal Food Store is the ultimate method of turning contaminated UK tap water into clean, health supporting drinking water for humans and pets. Unfortunately tap water and even bottled water (see BBC reports below) contains contaminants that will accumulate in human tissue over time. And don't be confused by the opinions of deluded commentators who say that distilled water can be harmful to your health. Nearly all the essential minerals and electrolytes that humans need to maintain optimum health can be obtained from a well balanced diet of unprocessed foods - e.g. seeds, veggies, fruits, algae & seaweeds - and not from tap water or bottled water which often contains many harmful toxins and synthetic chemicals. There are millions of health conscious consumers around the World who drink distilled water on a daily basis and have done so for decades without suffering any negative side-effects. Contrary to popular belief, distilled water is very economical to produce; the typical cost per litre in the UK is around 8 pence during the day - or using the Economy 7 overnight tariff, less than 5 pence per litre (depending on your suppliers rates). This is a far better option compared to expensive bottled water, plus you have the peace of mind knowing that your health will benefit from pure h2o that contains no chemicals or pieces of micro-plastic that have been discovered in nearly all other sources of drinking water. 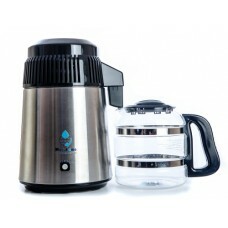 Pure distilled water has an infinite number of uses including hydrating people, pets and plants, eliminating hard scale from tap water in your iron and kettle, healthier food when cooking & steaming, better tasting tea, coffee & soft drinks, and the list goes on. Try diluting your liquid hand & body soaps, shampoos, bathroom and kitchen cleaning products with distilled water, you'll be astonished at how much longer each bottle will last! In fact, our amazing distiller machine could easily pay for itself during the first 12 months. Have a chat with one of our experts for even more money saving ideas - our advice is always free. This top of the range deluxe model (see above) includes a 4 litre glass collection jug (we don't recommend using plastic jugs) that you can store in the fridge to retain freshness. If you are concerned about the lack of minerals in distilled water then simply add a small pinch of Himalayan Crystal salt, the EauWelle Carbon mineralising stick or a plant sourced liquid mineral supplement for enhanced taste and texture. Our super reliable pure water distiller is covered by a generous TWO YEAR (UK) parts & labour warranty (return to our service depot for repair or replacement). We recommend that Marine Phytoplankton and other nutrient-dense whole food supplements be consumed when possible with pure, distilled water. You will be pleased to learn that our stylish and compact water distiller includes as standard (other manufacturers charge extra) a generous supply of granulated carbon sachets. These are designed to absorb any chemical gases (VOC's) that are often released from tap water during the distillation process. Each machine is securely packaged, ensuring safe delivery to your home or office and comes complete with a standard 3-pin plug, a set of accessories and instruction manual. You will be delighted with the clean, fresh taste of pure water without any chlorine, chlorination by-products, fluoride (added to the Public water supply in some areas of the UK), growth hormones and pharmaceutical residues, heavy metals, viruses and harmful bacteria. Order today, you'll be glad you did! IMPORTANT: We cannot accept orders for this electrical item outside of the United Kingdom.